You know some of those small things that happen and that don’t seem that significant at all. Like your wife prepares a cup of tea, serves you and it just looks normal- why appreciate anyway when that’s her duty! After all it’s not a favour that she’s doing so there shouldn’t be any expectation from her! I am lost somewhere in town – I ask the ‘soldier’ for directions – no sooner has he shown me than I take off even without saying thank you. A matatu conductor has been so good (a very unusual scenario) but immediately I alight I zoom off without even looking at him and saying ‘poa buda, baadaye.’ I think we are a society where being grateful and appreciating others is seen as a very awkward thing. In fact, sometimes those people you appreciate may look at you suspiciously as if you just dropped from another planet. At the centre of ingratitude is a heart that is so focused on self. An inward looking person can never show appreciation for the ‘small things’ that others have done… but will feel so bad when the same happens to them! And, unashamedly so, that’s what most of us are- narcissism is our being cool! At the office, it’s tea time. Tea has been prepared, it’s ready but there’s no-one to serve it with the snacks. So, I go to the kitchen, pick the stuff and everyone is made aware that it’s all ready to be consumed. Then came the support staff and on realising that it’s already been served, says “Oh, you guys have already served. Thanks to the person who did. I’d rushed out to get some items for lunch.” There I was thinking “They all forgot. Am the one who brought it and served!” Oh! What a feeling! Wait… “Kwisha, you’ve already received your reward” one of my colleagues said. Of course, we laughed out loud and I said “am just being humble” but this made me think hard. 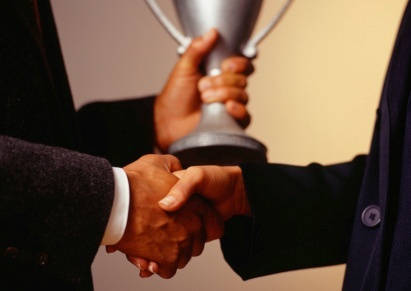 The real test for me is can I do something without expecting to be congratulated and commended however good it is? But even bigger, can a single day pass without me going out there and deliberately seeking for glory and praise? Just listen to the way we introduce ourselves? What is the big thing that will remain in the people’s minds? We go on each day redeeming our ‘bonga points’ at the expense of that greater reward that we await when our Saviour returns… that eternal, intangible, incomparable reward, I don’t wanna lose that. 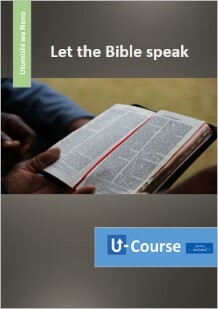 Had a great time in Arusha last week at Munguishi Bible College. A wonderful work is going on there. Very sharp guys. We were often learning far more from them than we were imparting. 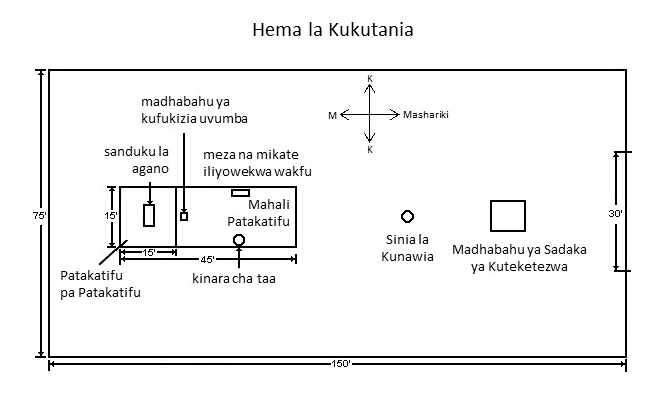 Fidel did an excellent job teaching us Walawi (Leviticus) in full Kiswahili. 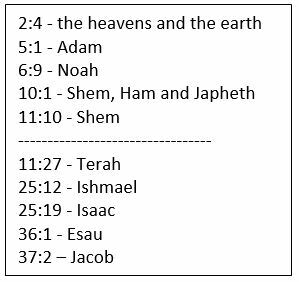 The story is told in ten parts, divided by the phrase, “This is the account of” or in more literal translations, “These are the generations of…” And those ten divide quite clearly between the first five and the second five at Genesis 11:27. 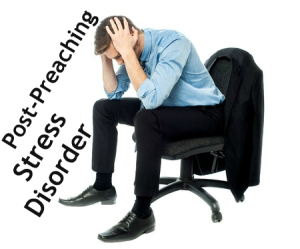 The first half goes wrong with disobedience and exile away from God’s presence. By Genesis 11 people are still going away from the East (v2) and still being disobedient (v4). But when we get to Abraham in the next chapter we find obedience and a movement towards God’s land. (At the end of the Book of Genesis we find another obedient man who has the presence of God (Gen. 39) and looks forward confidently to the land (Gen. 50). Genesis 1-11 is universal (‘the nations’) but from Genesis 12 there is a focus on God’s particular “great nation” (v2). While the people at Babel wanted to make a “name” for themselves, now God says, “I will make your name great” (12:3). Genesis 1-11 is mainly curse with glimpses of blessing. From Genesis 12 there is an emphasis on blessing (the word comes 5 times in Gen. 12:1-2 compared to “curse” 5 times in Gen. 3-11). In the second half there is still plenty of curse around (barrenness, famine, death etc.) but in each generation there is one Blessed One to whom all can bow and be blessed through him. Genesis 1-11 is mainly about discord and disunity (Gen. 4, 9, 11) while Genesis 12-50 gives examples of the blessing of reconciliation (Gen. 33, 42-50). Even after the turning point of chapter 12 there is still a major tension because Sarai is barren (Gen. 11:30). It doesn’t look like any of the promises of a great nation and blessing through offspring can be fulfilled. The Word of the LORD comes to Abram – God spoke to Abraham in Genesis 12 but in chapter 15 we are told twice of the ‘Word of the LORD’ – something (or someone) who will become hugely important as we move through Bible history. Stars – The first mention of these since the opening verses of Genesis; suggesting a new creative work (cf. Rom. 4:17; 2 Cor. 4:6). Faith – It was implicit at Genesis 12 but here in Genesis 15 it is explicit (the first use of the word in the Bible). Righteousness – We have already heard that Noah was righteous (Gen. 6:9) but here for the first time we find out that righteousness is something that can be credited to someone who simply believes God’s promises. Covenant – God gave Abram a promise at Genesis 12 but here in chapter 15 the LORD formally ‘cuts’ (makes) the great covenant of grace (v18). Most amazingly, when we compare the strange night-time events of this chapter with the covenant ceremony described in Jeremiah 34:18-19 we see that one party is sleeping (cf. Gen. 2:21) and God alone is meanwhile taking on the full responsibilities of covenant keeping and of suffering if it is broken. 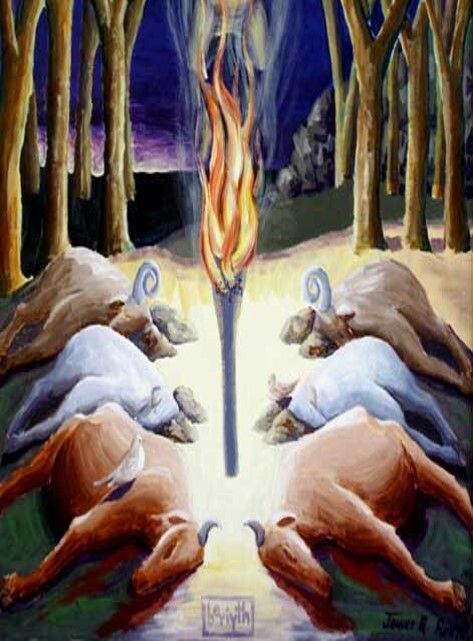 Abram’s obedience to God’s call in Genesis 12 is important but this divine action in chapter 15 – the fire of the LORD moving between the halved animals – is the ‘decisive action’ which changes everything in the Book of Genesis. So there is a sense in which the Book of Genesis works as one long story – setting (Gen. 1-2), problem (Gen. 3), escalating tensions (Gen. 4-11), turning point (Gen. 12), decisive action (Gen. 15), unfolding of God’s covenant and choice of the children of Abraham (Gen. 16-50). But when we finish the book we know that this is very obviously not the end of the story started in Genesis 1-3. The promises of Genesis 3:15 and chapters 12 and 15 are not fulfilled. Death is still reigning. We’re not in God’s Land. We still need a curse-reversing serpent crusher. See also A. C. Leder, The Structure of Genesis.